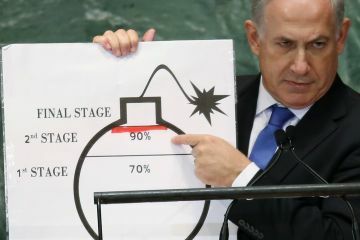 … Despite that clear information that Mossad surely already had at the time of the UN speech (h/t Andrew Fishman for the link), Netanyahu chose to portray Iran as ready to zip through the final stage of enrichment: … ]. that should be the end of sanctions against iran, right? not so long as our republican political leaders continue to work hyper-diligently to capture the loyalty of democrat zionist zealots into the republican party in order to use them for anti-contraception, anti-banking regulation, anti-carbon emissions regulations, etc. Again, a bomb can’t be built using highly enriched uranium, it must be converted to metal, a difficult process. So the “negotiations” are meant to result in a way to keep the US boot on the Iran neck, but that will be unacceptable to Iran, as it should be. Bibi lied to the UN?? Ya don’t say. Water is wet, the sky is blue, blah de blah. Truly don’t mean to make light of your post. Just had to say it. Bibi’s a monster, but sadly he seems to “our” monster… or is Bibi running the US? Hard to tell from the peanut gallery sometimes. Someone ought to “pie” Bibi when he shows up. I think a nice blueberry pie would do, don’t you think? A sterling idea. Let’s put our thinking caps on and try to think of a government that DOESN’T lie. Bhutan, perhaps? I’ve done some research on Bhutan in advance of a hoped for trip there either later this year or next year. Depends on which govt and when vis Bhutan. Like most tribes/nations, they’ve had their own smallish imperialistic things going on back in the eons of time. It does appear as if the Monarchy and govt there are striving for honesty and fair treatment of their citizens. My still somewhat ignorant “take” on Bhutan is that it seems to be among the very few (not sure who else might fall into the category) that is trying to lead a more honest and transparent govt. One of the most irritating aspects of this non-story is the continued credence given to the idea that Iran has a nuclear weapons programme. It has been abundantly clear for years that, as the CIA and other US Intelligence agencies have confirmed, it has not had any such programme in this century. The idea that it might have, a possibility which has been used an excuse to inflict enormous suffering on the Iranian people, is only sustained by underhand tricks of the sort the Merlin programme exemplified. It is time for the warmongers’ rumours, half truths and outright fabrications not to be tolerated. What those who suggest that there is any evidence at all of an arms programme in Iran are engaged in is conspiracy to murder by imperialist adventure. Decent people should shun these liars-at the very least they should protest against taxes being used to facilitate the evil. Given their history of invading, pillaging and plundering their neighbors if I lived next to the Israelis I’d spend every extra dime I had on getting a nuclear weapon. Anyone living in their area who doesn’t do so is foolish.